The 48-105 studio, called “Foundation II,” is the second studio in CMU’s professional B.Arch program. It builds on the lessons from 48-100 about clear architectural communication, abstract spatial-definition, and developing a confident design process. We seek greater rigor in synthesizing and creating order from a larger array of parameters and performance criteria, but also stress a tolerance for uncertainty and multiple truths. We practice an iterative and reflective design process, emphasize the role of constraints and editing as fundamental to the design process, and explore the ideas of systems and computational thinking. Greater emphasis is given to computing, which is framed as a tool for describing and analyzing, but also for generating new understanding and testing proposals. Beginning with more abstract 2D, 3D, digital, and analog formal design and critical making exercises, and ending with the design of a small building addition, we explore how materials, geometry, context, experience, and performance criteria can be harnessed to create inspiring and useful architecture. The design process is still carefully controlled, but students are given autonomy to begin to speculate and take careful risks, both in their designs, and presentations. The semester is divided into four primary projects. 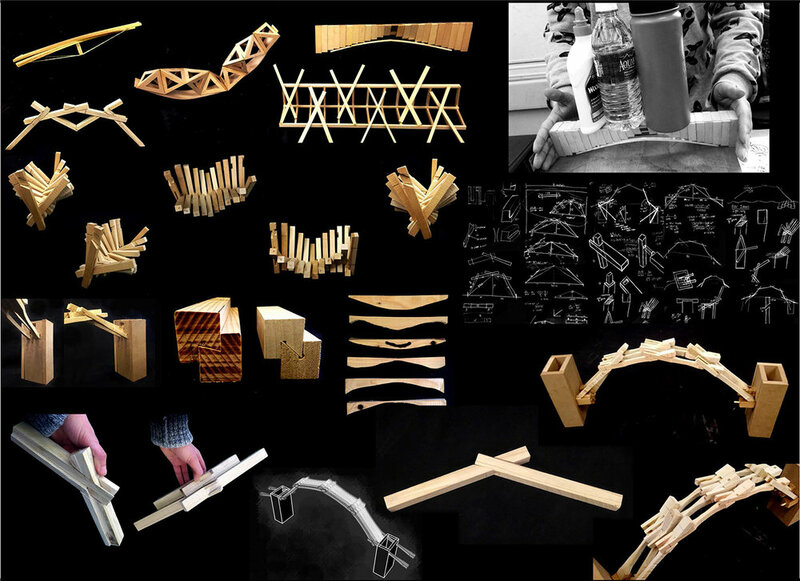 A series of formal exercises designed to integrate analog and digital tools and techniques more seamlessly in the design process, especially in modeling complex geometries out of paper to have a marble “perform.” View the assignment. This project continues CMU’s long tradition of a 1:1 woodshop project in freshman studio. Students work in pairs to design a “span” between two points that satisfies a series of formal, material, and structural performance criteria, and instills confidence in “making” and creating prototypes to test creative design ideas. View the assignment. The single most important source, and tool, for learning about architecture, is great architecture. Students will continue to build skills in “reading” and analyzing drawings, photos, and texts about great architecture, as well as learning to look and understand buildings more deeply in person. This semester we will be studying “Libraries” as a building type, investigating both great libraries from around the world, and analyzing CMU’s Hunt library as a “site” for design. A small addition or “parasitic” insertion in Hunt Library that will help transform (part of) the library and how we use and experience it. 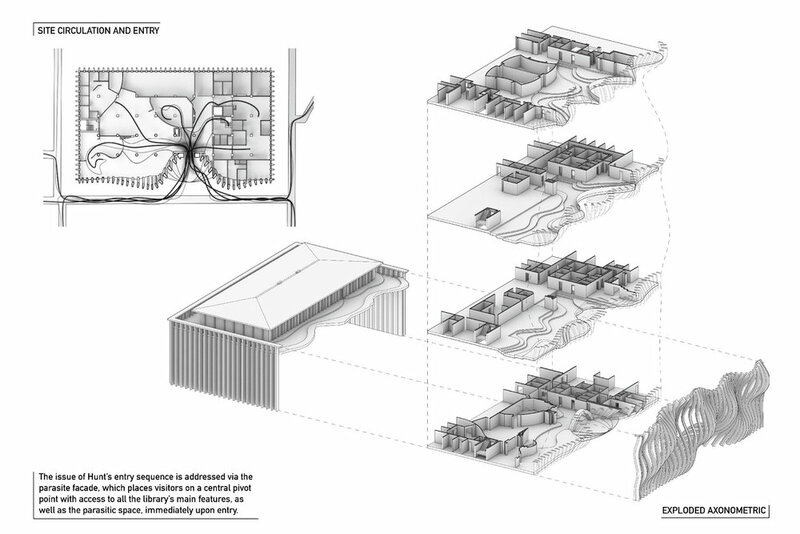 The primary focus will be on exploring the connections, transitions, and boundaries between inside and outside, both as a sequence of well-choreographed spatial experiences, and construction. View the assignment. You seek feedback, and incorporate it productively into your design process. You see constraints of all kinds as levers of creativity and ingenuity. You search for criteria outside of your personal desires as primary motivators for design. You look for systems or patterns in the given, external circumstances of an assigned project (site, precedent, materials, spaces, building type, program etc. ), and seek to establish systems, geometries, and rules to generate coherent, rich design. You have command of, and can select appropriately from, a wide array of architectural drawing and representation skills (2D and 3D, analogue & digital techniques, physical and digital models) for the most effective, efficient, and elegant results. You implement research skills relevant to the design process, and to begin to understand both the similarities and differences between research and design. You have begun to explore how architecture is made and constructed, and use that understanding to create vital and memorable experiences. You feel confident making robust, well constructed models that begin to move beyond representation, towards prototypes that test performance and ideas. You are accumulating experience, knowledge, and the ability to discuss the fundamental elements, basic design principles, and important disciplinary questions of our field, so that you can begin to define “what is architecture?” and distinguish it from related disciplines. Each core studio is coordinated by a full-time faculty member, who develops the studio's pedagogy, content, projects, and faculty teams within the framework of the overall curriculum. The coordinator (in this case, Kai Gutschow) offers lectures, workshops and critiques to support the studio's learning objectives and make connections with associated coursework. Within each studio, sections of 9 to 12 students are led by the prominent practitioners who comprise our adjunct faculty.